Despite their beauty and value for pollinators and birds, native thistle species have long been undervalued. I often hear people make condescending remarks about thistles when I table at events. Someone may see that I have native thistle seeds for sale and make a comment along the lines of: “Thistles are horrible, why would you want to plant those?” What they don’t realize, however, is that native thistles play a critical role in native ecosystems. 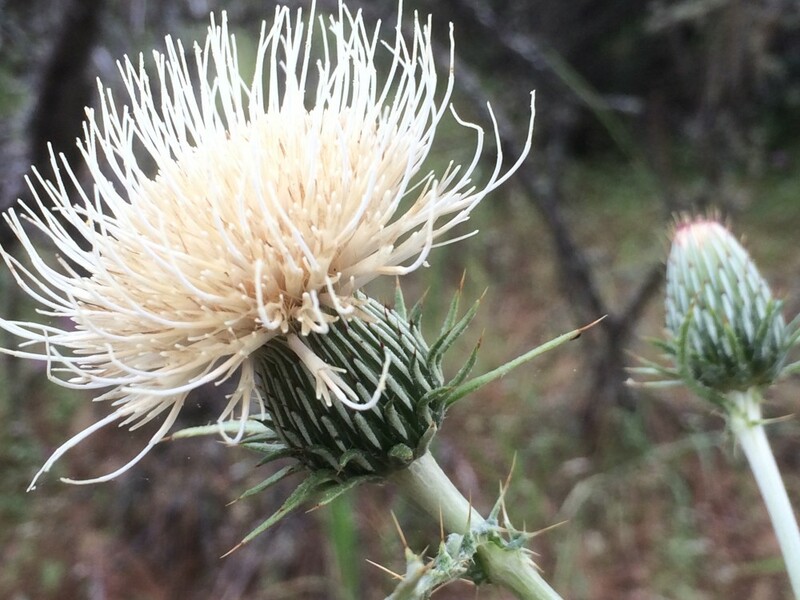 Native thistles get a bad rap simply because of people’s association with their weedy, invasive relatives like bull thistle (Cirsium vulgare) and Canada thistle (Cirsium arvense). 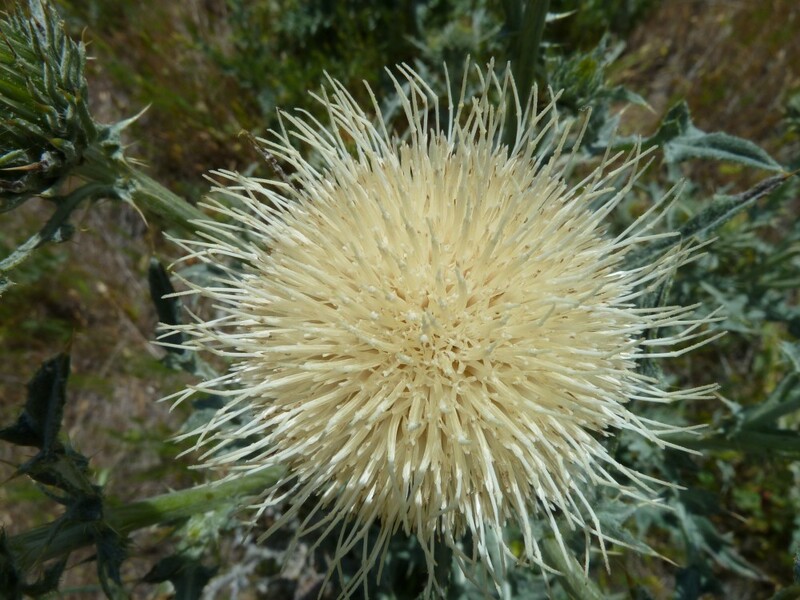 Bull thistle was introduced into Oregon in the late 1800s, and it now occurs in every county in the state. Canada thistle has been around for about the same time, and once established, it is a fierce competitor, exuding allelopathic chemicals that inhibit the growth and survival of neighboring native plants. Just the mere mention of the name, yellow starthistle (Centaurea solstitialis) — a knapweed, not at true thistle — makes the blood boil of those who live in an area with a heavy infestation. These are highly invasive plants that are a real threat to native ecosystems as well as economic interests in agricultural areas. So why does the justified distaste for non-native, invasive thistles seep into some people’s psyche, affecting their perception of native thistles? Is it simply because they’re spiny? Is it because they only associate thistles with weeds? Its hard to say for certain why this is, but what we can say, with certainty, is that native thistles deserve a spot in your pollinator garden or a site on your land with good drainage, good sun and little competition. Native thistles are never aggressive and won’t spread rapidly like the non-native species do. True thistles belong to the genus Cirsium. 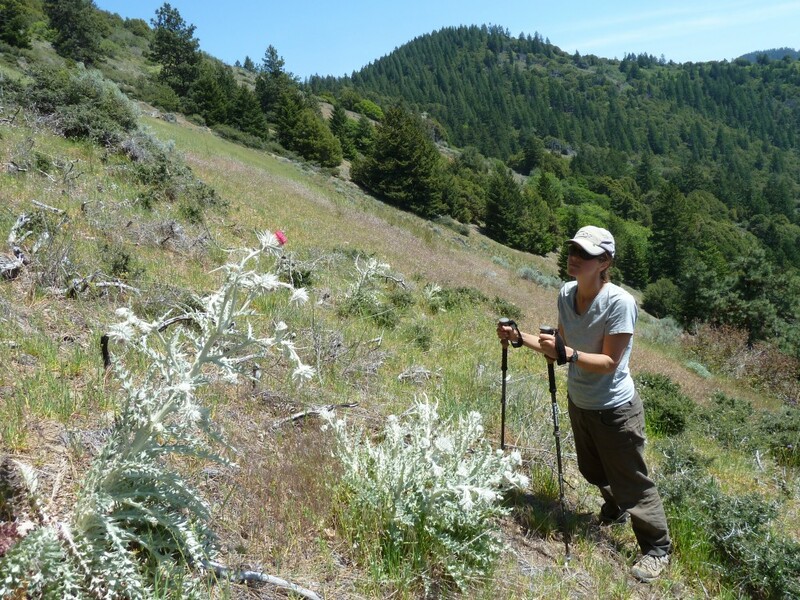 California has 19 native species of thistle in the genus Cirsium, while Oregon has 14. Some of the species have multiple subspecies as well, making for a lot of diversity in color, leaf shape, size and spininess. For instance, western thistle (Cirsium occidentale) has numerous different subspecies and is known by different descriptive common names, such as snowy thistle or cobweb thistle, referring to the cobweb-like fibers covering the phyllaries at the base of the flower. 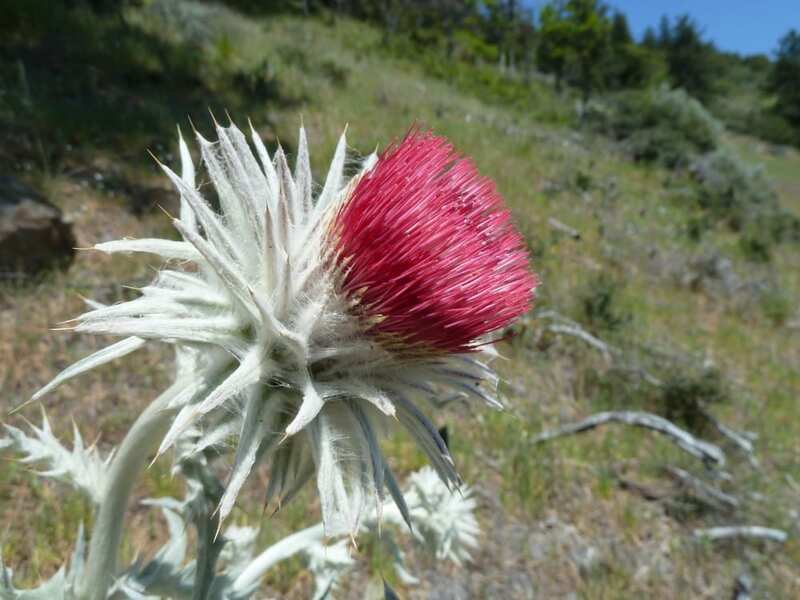 Ashland thistle (Cirsium ciliolatum) is endemic to the Klamath-Siskiyou Ecoregion. Thistles are in the sunflower family (Asteraceae), with many individual flowers packed within each flower head, protected by a spiny involucre. Like a sunflower, each flower produces a single seed, and each seed head produces many seeds. Nutritious thistle seeds are highly prized by birds such as the Lesser or American goldfinch. According to the Oregon Department of Fish and Wildlife, “Their diet is composed almost entirely of seeds, with those of the sunflower family, particularly thistles, strongly preferred.” Birds also use the fluffy thistle chaff to line their nests. The list of butterfly species that use native thistles for nectar is too numerous to list here. It is common to see butterflies nectaring on thistles. Several butterfly species use native thistles as a host plant for their larvae, including: Painted lady (Vanessa cardui), Mylitta crescent (Phyciodes mylitta), and the California crescent (Phyciodes orseis). Mylitta crescent caterpillars using western thistle (Cirsium occidentale) as a host plant. Hummingbirds are especially fond of thistle nectar. Often spending a considerable amount of time around a thistle patch, sipping nectar in between aerial acrobatics. Suzie watching a hummingbird nectar on western thistle (Cirsium occidentale) in the Applegate Foothills. The hummingbird was too fast to get a good photo of it. Check out the size of this plant! It’s at least 4′ tall! Native bees use thistles too, and will sometimes be found on flowers already teeming with beetles and other native pollinators. Because thistles draw in so many beneficial pollinators, they also bring in predators such as spiders, ready to ambush unsuspecting prey. 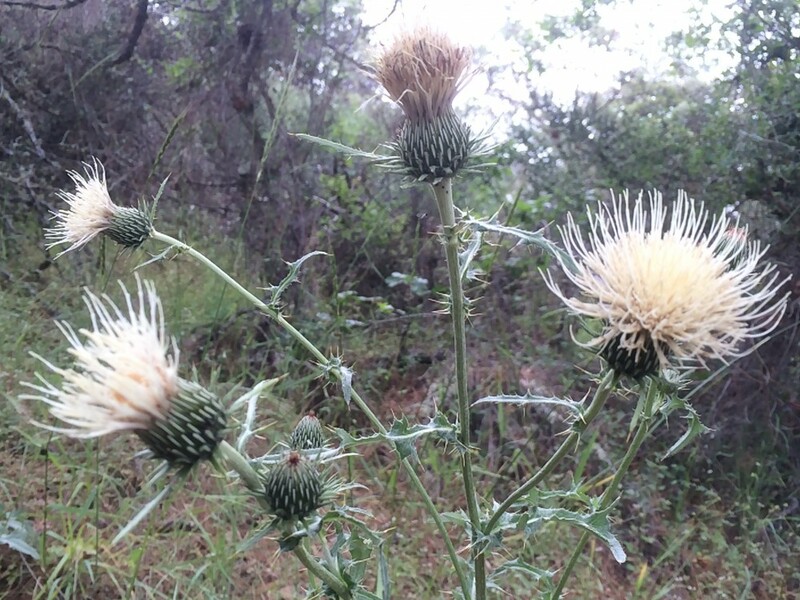 Native thistle flowers are a good spot to hunt because the insect visitation rates are so high. Native thistles inhabit a variety of habitat types. Most are found on poor soil with good drainage, harsh sun and very little surrounding competition from other plants. There is, however, one thistle in the Klamath-Siskiyou Ecoregion that grows in moist, high elevation meadows: Brewer’s swamp thistle (Cirsium douglasii var. breweri). 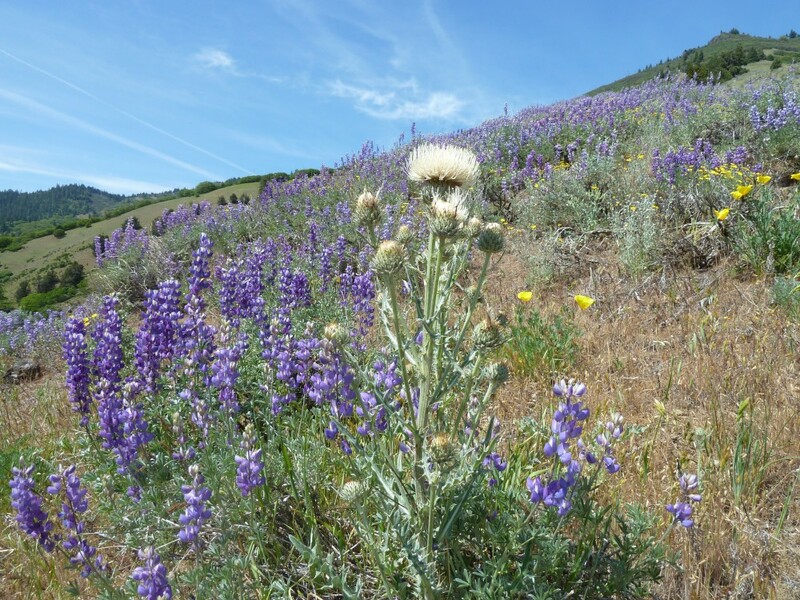 Here at Klamath-Siskiyou Native Seeds, we are happy to promote the use of native thistle species for the benefit of wildlife. We currently offer western thistle (Cirsium occidentale) seed for sale, with the hope of increasing our native thistle offerings in the future. This species is a biennial, meaning that it will send up a rosette of leaves the first year, flower in the second year, and mostly likely die after that, spreading seeds for future generations. The species can live longer than two years, and sometimes becomes a perennial, but it is good to only expect a biennial flower. Western thistle does well in a dry garden setting with good drainage. It can be direct seeded or sown in containers and transplanted. Sow seeds outdoors or in an unheated greenhouse in the fall or winter for germination in early spring. Plant native thistles for the benefit of hummingbirds, butterflies, bees and birds! All photos are those of Klamath-Siskiyou Native Seeds, unless otherwise noted. Ashland thistle (Cirsium ciliolatum is endemic to the Klamath-Siskiyou Ecoregion.